The 2nd Annual Martin County Open Studio Tour takes place on Saturday, January 20 and Sunday, January 21st. This FREE event is open to the public! 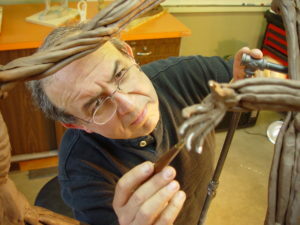 View art creations, art demonstrations and meet over 40 participating artists. Free Tour maps and Tour Guides are available at the Marker 23 Gallery, Arts Council of Martin County, Fish House Art Center, Kling Gallery, Wine & Decor, Stuart Art & Supply or download our free MCOST App. The Rickie Report shares the details here. Kudos to the Martin Artisans Guild! Artists supporting artists and bringing the public to see how it is created! Saturday, January 20 and Sunday, January 21st. This FREE event is open to the public! Out mission is to organize and promote artists’ Open Studio Tours in Martin County, FL in order to provide the public with unique opportunities to meet artists and explore a wide variety of art forms. To promote Martin County FL as a center of art. 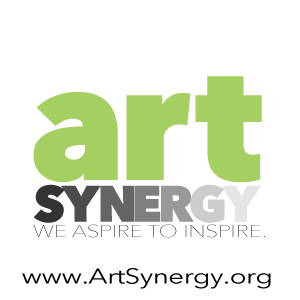 To provide opportunity for artists to exhibit original artwork to the public. To develop a sense of shared community and support among artists. To foster the concept that success for one artist benefits all artists. To present Artists’ Open Studios as a venue for purchasing art. If you are a Martin County artist, get involved! If you are interested in sponsorship, get involved! Donations are vital to our growth, as we use them for marketing, events, and public outreach. If you are just interested in the arts and want to volunteer; Get Involved! 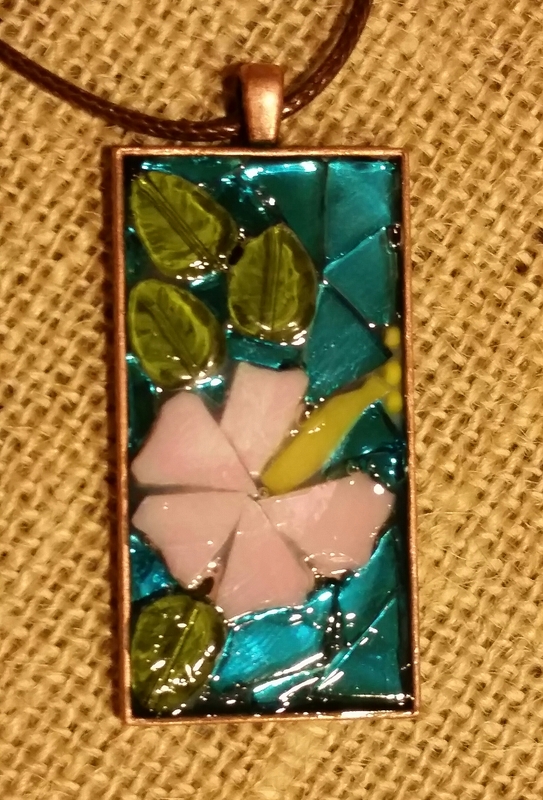 Explore the latest offering – MOSAIC JEWELRY – from Port Salerno Mosaic Studio. Go to their location in downtown Stuart or they’ll COME TO YOU! Diane and Asia offer mosaic classes, mosaic art and commissions. 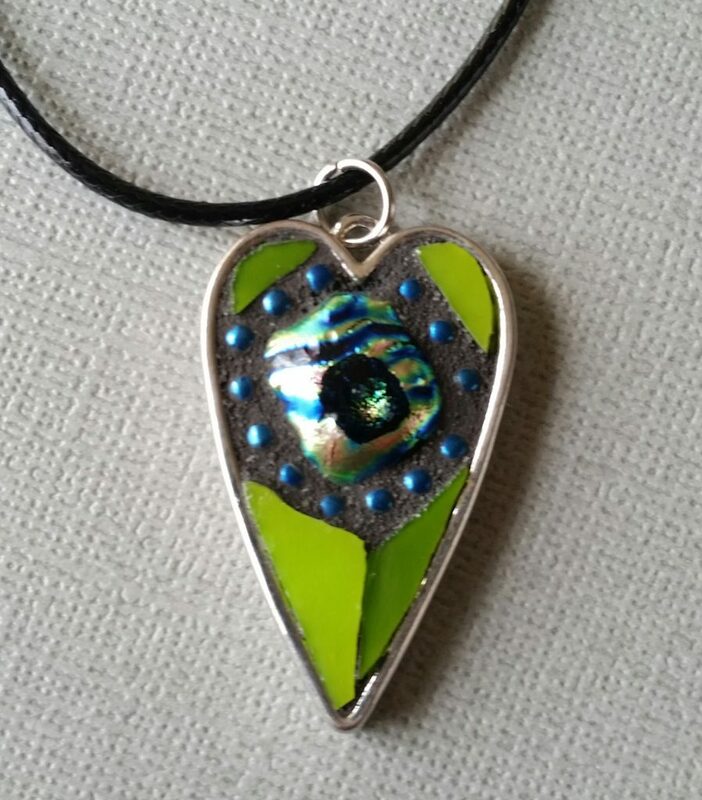 An all-day workshop on the basics of mosaics is offered periodically in the studio, but their newest class “Mosaic Jewelry Pendants” can be ‘taken on the road’. ATTENTION Activity Directors And ORGANIZATIONS! 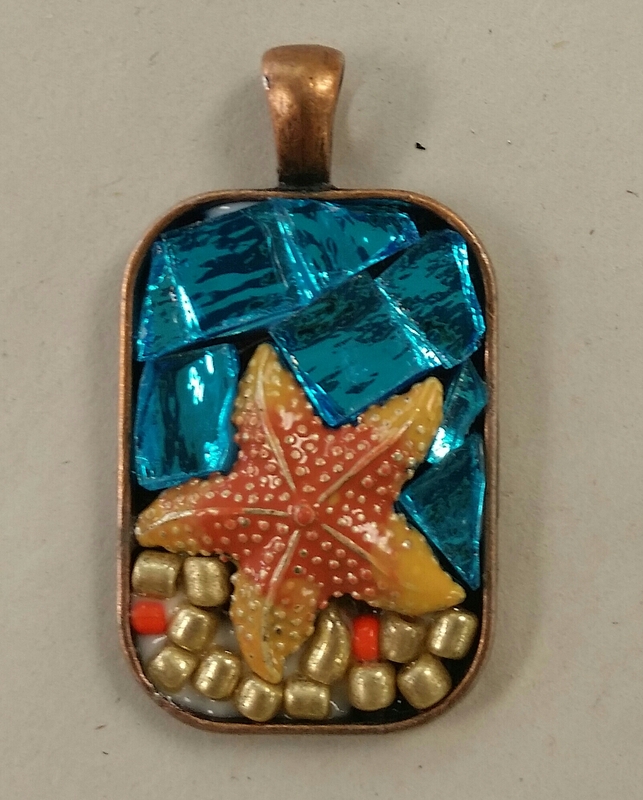 The NEXT class is April 5th at Christine’s Coastal Treasures, Home Depot Plaza, US 1, Jensen Beach. The Rickie Report shares the details and some sneak peeks. This beautiful space (previously in Port Salerno) now in downtown Stuart has developed a very popular new class! Diane and Asia regularly offer mosaic classes as well as sell mosaic art and do commissions. 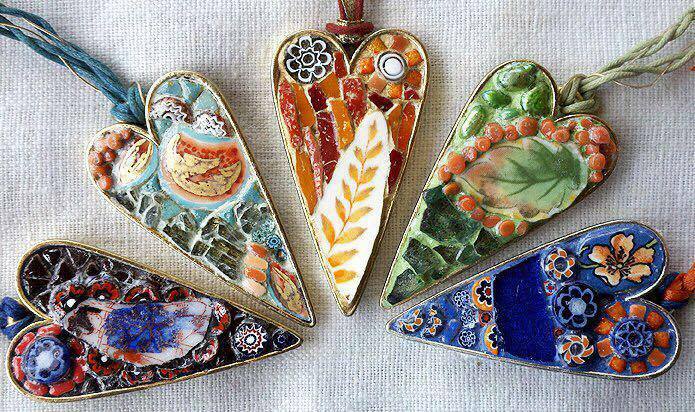 An all-day workshop on the basics of mosaics is offered periodically in the studio, but this new class ‘Mosaic Jewelry Pendants’ can be ‘taken on the road’. Attention activity directors! Your community can have Diane and Asia come to your clubhouse and present this fun three hour class where students will learn to make beautiful mosaic pendants. Painting classes are fun but how about something new and different to offer the members of your club? These talented mosaic ladies will come to your clubhouse with all the required materials and run the class. 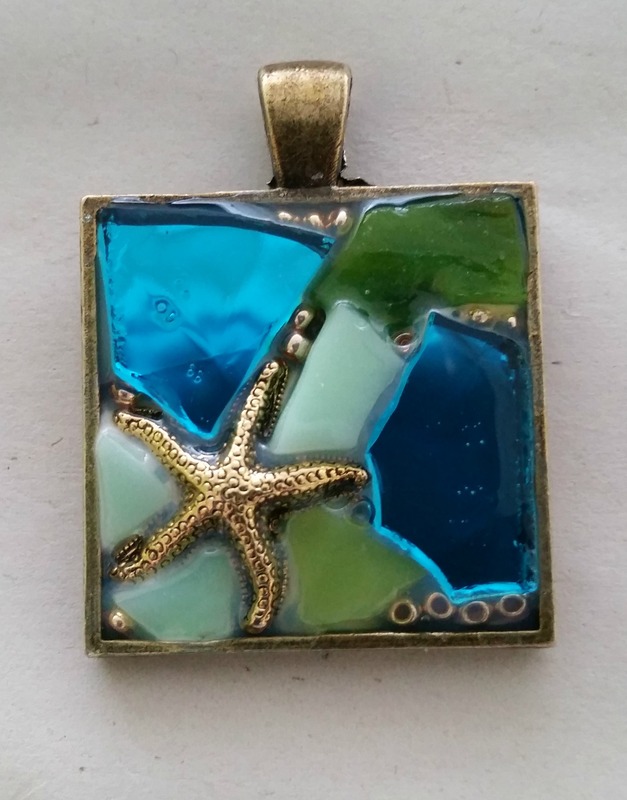 Pendants can be done with glass, tiles, beads, china, charms – the options are endless. It is fun, easy and the student goes home with one or two mosaic pendants. The fee is $45 per student. Minimum student number is 10 and maximum number of students per class is 20. (The class can be conducted more than once if your group has more than 20 members that sign up). The next class on the calendar is April 5th (1-4pm) at Christine’s Coastal Treasures, Home Depot Plaza, US 1, Jensen Beach. Christine’s is a coastal home décor (and treasure) shop with a great classroom space in the back. Christine teaches chalk painting (bring your small furniture piece – and learn to make your own chalk paint!) Find furniture painting and other art classes on Christine’s website www.christinescoastaltreasures.com. Register for this upcoming Mosaic Jewelry class on the website or call Diane to discuss hosting a class for your group. If your group is looking for something artistic to try that everyone will enjoy, please consider this class! We are available to run this class at our location or yours. Diane tells The Rickie Report, “Locals, we are here all summer! If you are scheduling for next year, we are happy to take a reservation for a class in the upcoming 2018 season”. You can usually find Diane and Asia in the studio Tuesday through Friday from 10:30-4:30pm or every other Saturday (calling in advance is recommended). The First Annual Martin County Open Studio Tour will take place on the weekend of January 21-22, 2017. “New Realms of Working Spaces” will introduce Martin County artists to regional patrons of the arts and provide an intimate look inside the working studio space of local artists. The MCOST event is FREE and OPEN to the public. The tour includes artists working in fiber, ceramics, mixed media, oil, and textured painting. The Rickie Report shares the details and sneak peeks. Tour Brochures will be available at many Martin County Locations, including: Martin County Arts, Martin County Libraries, Elliot Museum, Stuart Art and Supply, Fish House Art Center. Many artists will be performing demonstrations of their techniques at various times during the event. This event is free and open to the public. Martin County is home to working studios featuring art by both internationally renowned and local artists working side by side, inspiring each other. The First Annual Martin County Open Studio Tour will take place on the weekend of January 21-22, 2017. “New Realms of Working Spaces” will introduce Martin County artists to regional patrons of the arts and provide an intimate look inside the working studio space of local artists. The MCOST event will be open at no charge to the public. The tour has already enlisted artists working in fiber, ceramics, mixed media, oil, and textured painting. The Rickie Report shares the details of the 23 studios and urges you to MARK your CALENDARS! This event provides the public with a rare opportunity to meet local artists and to explore a wide variety of art forms. The tour has already enlisted artists working in fiber, ceramics, mixed media, oil, and textured painting. The Open Studio Tour will invite our local community to view the private space where an artist creates their work. This will foster new connections between artists and their community. Promotion of the event will bring a broad audience to view artists’ work. And collectors can buy directly from the artists at their studios. Many artists will be performing demonstrations of their techniques at various times during the event. The varied media, time for personal exchange, and unique setting ensure this will be an exceptional opportunity for both artists and patrons. The MCOST event is non-profit and will be open at no charge to the public. Tour Brochures will be available at many Martin County Locations, including: Martin County Arts, Martin County Libraries, Elliot Museum, Stuart Art and Supply, Fish House Art Center. The First Annual Martin County Open Studio Tour will take place on the weekend of January 21-22, 2017. “New Realms of Working Spaces” will introduce Martin County artists to regional patrons of the arts and provide an intimate look inside the working studio space of local artists. The MCOST event will be open at no charge to the public. The tour has already enlisted artists working in fiber, ceramics, mixed media, oil, and textured painting. The Rickie Report shares the details and urges you to MARK your CALENDARS! 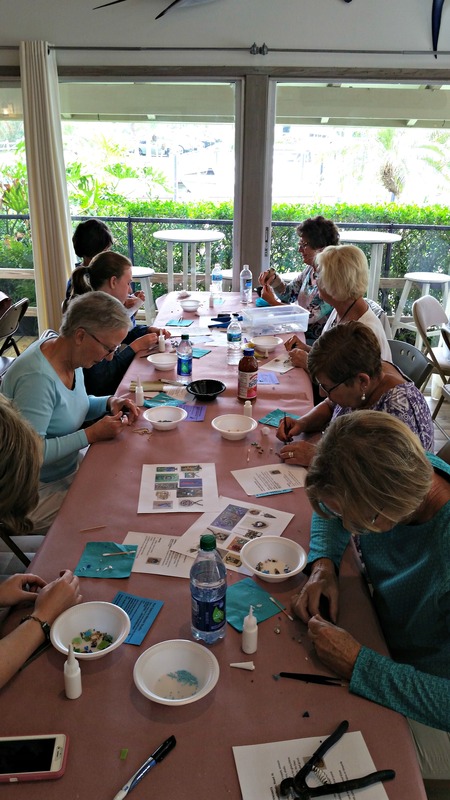 Port Salerno Mosaic Studio in downtown Stuart sells mosaic art and offers classes. In addition to the monthly “Intro to Mosaic Workshops”, there is a line up of Visiting Instructors and special events! Don’t miss Martin Cheek’s “Working with fusions in mosaics” in February ( sign up now)! 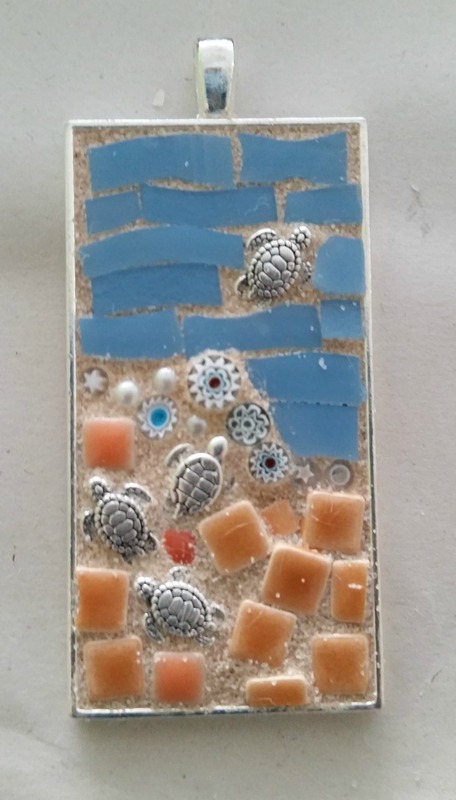 Port Salerno Mosaic Studio is being featured as the ‘Artists in Residency’ at the Ground Floor Farm in downtown Stuart for the months of December and January. The Rickie Report shares the details and some sneak peeks. What a great gift certificate idea!!! The course will include lots of hands on work creating a mosaic, practical demonstrations, slide show presentations and individual instruction. Glass cutting, mosaic techniques and design elements will be covered. We’ll work on a 12″x12″ substrate. Students should come prepared with their own image or can choose from a number of images that will be available. Instruction will be provided to incorporate Martin’s original handmade glass fusions. Fusions will be used in combination with traditional glass (smalti, vitreous glass, millefiori and stained glass. Class is $385 plus $60 materials ( includes choice of 4oz. of Martin’s fusions, or a mix of fusions, millefiori or small gold leaf). You may also have martin create a specific one-of-a-kind fusion for your piece. The deadline to make that request is January 1st. Port Salerno Mosaic Studio is being featured as the ‘Artists in Residency’ at the Ground Floor Farm in downtown Stuart for the months of December and January. The Ground Floor Farm is a community farm, that promotes all thing community. Our aim is to help grow a more dynamic and resilient town through food, art, and fun. We are part (sub)urban farm, part experimental kitchen workshop, part arts and events venue, part banquet hall, part open-source community space. Yes, those are a lot of things for one business to be. We want to nourish Stuart with excellent food, practical and interesting know-how, and enriching cultural and artistic experiences. We want Ground Floor Farm to be as varied, vibrant, and expansive as our beautiful home town. So come; eat, learn, and enjoy. Make this space your own. The Port Salerno Mosaic Studio will be displaying and selling artwork as well as offering a special ‘Stepping Stone’ Workshop on Jan 8th. For more information see the links below. Port Salerno Mosaic Studio, previously located in the Fish House Art Center has moved to bigger headquarters in Downtown Stuart. Diane Concepcion, owner/artist and other instructors will offer classes and specialty workshops, including a Special 2 Day Workshop with Martin Cheek in February. Not interested in “making”? This is the place for you! Functional as well decorative items are for sale, or can be ordered for commissions. The Rickie Report shares the details and some photos. It is not too early to make your reservations. It’s amazing what can be mosaicked! Shortly after moving in, Diane and Asia threw a ‘Grand Opening celebration” the highlight was a student art show. The many students that enjoy working in the studio over the last three years brought and displayed their artwork . There was plenty of art (purely for art’s sake) but the functional mosaic art…coasters, trays, lazy susans, house numbers…wow! The variety of mosaic art that has been created in the studio over the last 4 years is amazing! 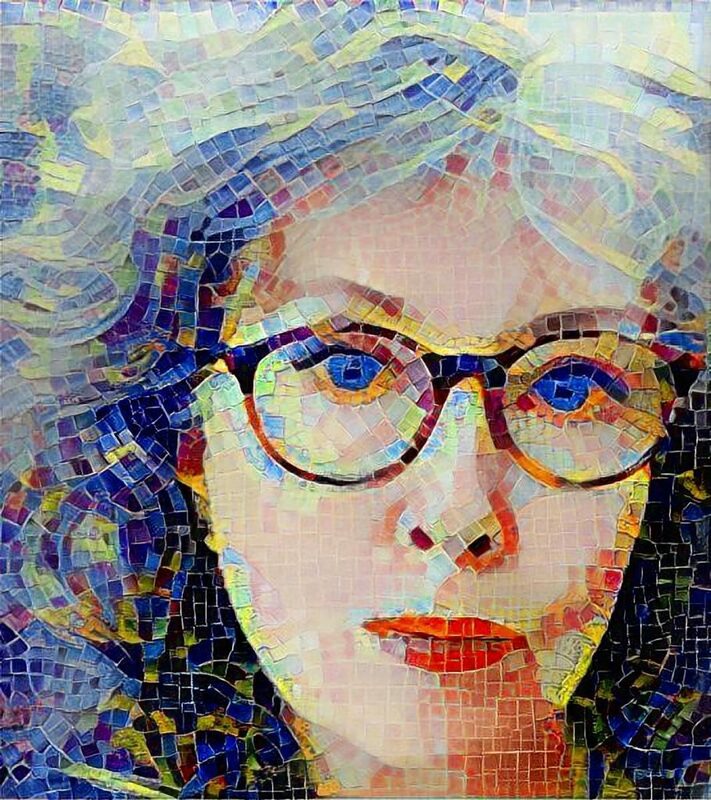 Diane has enhanced her mosaic self-education at the Union Square Art Cooperative in NYC and at the Institute of Mosaic Art, Berkeley CA. She has attended workshops with Martin Cheek, Mireille Swinnen, Michelle Petno and Jeff Halverson (some of the best known local and international mosaic artists). Diane’s portfolio is as varied as the application of mosaic art can be. She is experienced in stained glass, smelt and picassiette. 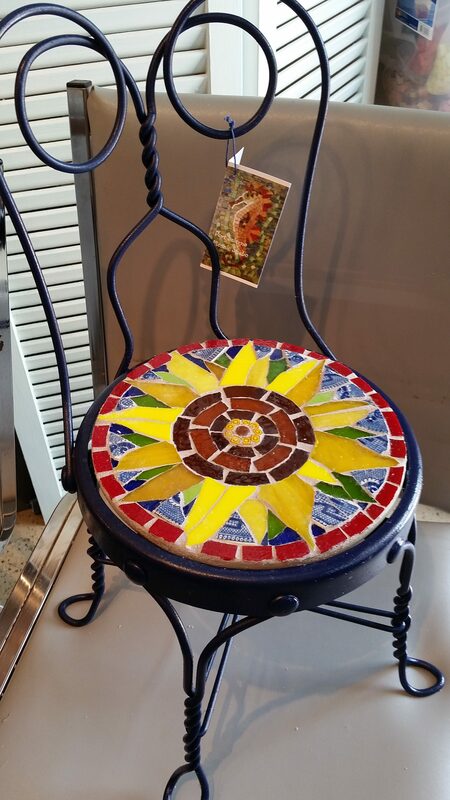 Diane has applied her art to garden items, upcycled art (mosaicking found items to give them new life), commissions for clients (address plaques, store signs), and has often explored her mosaic artistic voice. 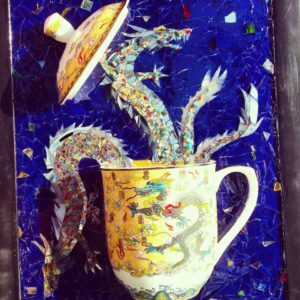 Also instructing at the studio is Asia Booth, an award winning mosaic artist of tremendous talent. 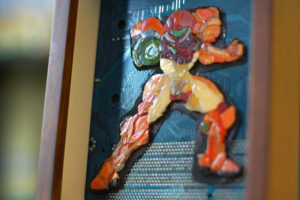 An avid ‘gamer’, Asia specializes in video game themed art, most of her work features extremely tiny pieces (all hand cut). Asia’s passion for drawing and unique mosaic design is reflected in her art. Her gamer pieces were featured in “A Fractured Perspective” a gallery showing by Luna Mosaics of Orlando. Asia teaches “Intro to Mosaic” and is available during studio hours for students. Asia and Diane recently both placed in the highly competitive Annual McMow Art Glass completion. Mosaic artist Francesca Delorme is the third resident artist instructor. Francesca, an accomplished art instructor from the Burke Mountain Academy in VT, has a strong background in graphic design, jewelry design and creation, plus the whole gambit of glass arts, including all forms of mosaic. Francesca rounds out the studio’s staff specializing in ‘picasiette’, the art of making mosaic from broken dishes, china and other found items. Francesca will be presenting a series of classes in picasiette and mosaic techniques (such as andamento and opus) this Fall and Winter. 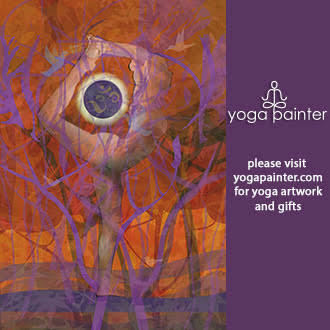 In the studio you can buy art, order a custom commission or take classes. The very popular ‘Intro to Mosaic’ day-long workshop provides the basics in mosaic techniques and you go home with your 8”x8’ mosaic wall art. ‘Intro workshop’s are conducted several times a month. You can also take advantage of the ‘Studio Hours’ where you can work on projects at your own pace. There is a reasonable fee for studio hours (which includes use of the tools and materials in the studio). The highlight of the 2017 season will be a 2 day workshop by Martin Cheek, an internationally known mosaic artist. He has been teaching for over 20 years and is the author of several bestselling books. Martin Cheek incorporates his own glass fusions into his mosaic art and will share that process during the 11-12 February workshop at the studio. Details on this workshop can be found on the studio’s Facebook page or by calling Diane. Special classes by mosaic artists and artists of other disciplines are being scheduled for 2017. Francesca will be presenting an ‘Opus and Andamento Workshop’. Opus and andamento are time honored techniques used in traditional mosaics. Francesca will review traditional applications and introduce a modern approach, discuss tessellation, patterns, negative/positive space and the student will put this instruction into practice on their own project under Francesca’s guidance. This is an excellent opportunity for advanced beginners or intermediate mosaic artists to delve into some of the more advanced techniques of the art. The studio will be participating in the St. Lucie County Rock and Gem Club Show at the Martin County Fairgrounds on October 22-23. They are particularly excited to be featured as the “Artist in Residence” at the Ground Floor Farm of Stuart, where their art will be featured for the months of December and January. The studio will present a special stepping stone workshop during their residency. 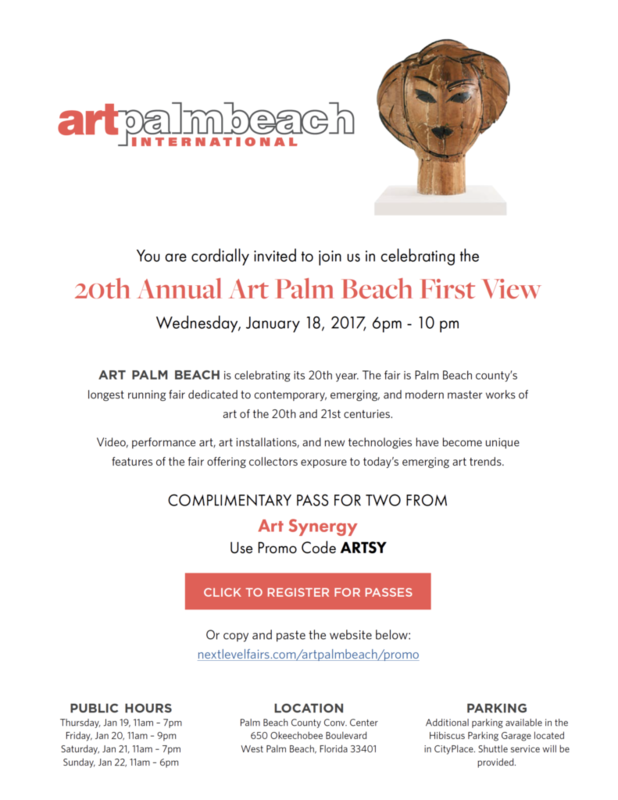 Fish House Art Center And Arts Council Of Martin County Invite You To Art Alfresco! Art Gumbo Gallery and Port Salerno Mosaic Studio, located at the Fish House Art Center in Port Salerno, have joined with the Arts Council of Martin County to present ‘Art Alfresco’. This fundraiser showcases 11 Council members demonstrating their art. The artists will be in action, plein air, and more on January 16th from 11-3pm. You couldn’t pick a better setting than the Fish House. Located on the picturesque Manatee pocket waterfront, this hidden gem houses the Art Gumbo Gallery, 8 working art studios, and the Grove Dock Bar.Entertainment will be offered by Alli Evans. The Rickie Report shares the details and some photos. 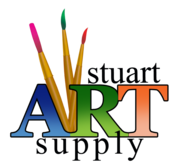 Art Gumbo Gallery and Port Salerno Mosaic Studio, located at the Fish House Art Center in Port Salerno, have joined with the Arts Council of Martin County to present ‘Art Alfresco’. This fundraiser showcases 11 Council members demonstrating their art. The artists will be in action, plein air, from 11-3pm on January 16th. You couldn’t pick a better setting than the Fish House. Located on the picturesque Manatee pocket waterfront, this hidden gem houses the Art Gumbo Gallery, 8 working art studios, and the Grove Dock Bar. If you haven’t visited the Fish House, you will be surprised to find art studios that include mosaic, clay works, weaving, shibori dyeing, lampworking and other unusual arts. Support the arts council by spending an enjoyable afternoon at the Fish House, watch art being created, visit the unique studios and have lunch at one of the many restaurants in the area. Entertainment will be provided by Alli Evans. The art created that day will be raffled; visitors can buy chances to win the art created at Art Alfresco. Completed artwork will be displayed at the Art Gumbo Gallery for 2 weeks following the event to encourage additional ticket sales. All proceeds go to the artists and the Arts Council. Art Alfresco will culminate on January 29th with a champagne toast at the Grove Dock Bar for the artists, while winning tickets are pulled. Mandel JCC Offers One-Of-A-Kind Tour Including Hutchinson Island, Elliot Museum, Gilbert’s Bar House Of Refuge, Fish House Art Center. Registration Now Open. The Mandel JCC offers a one-of-a- kind tour around the historically beautiful Hutchinson Island! The day begins at the Elliot Museum, which was built by Sterling Elliot’s proud son Harmon as a tribute to his father. Travel through the mind of this creative genius, holder of over 125 patents and inventor of a critical element leading to the success of the automobile. In June of 2012, the Museum merged with the Classic Boat and Maritime Museum,offering a wonderful collection of classical boats, boat models along with appreciating local maritime history. Visit Gilbert’s Bar House of Refuge with picturesque views of the Florida coast while visiting one the oldest structures in Martin County. Enjoy a wonderful lunch at the Pawnbroker. End the day at The Fish House Art Center, with glass arts, fine art painters, silk artists who create wearable art, a weaver and a nationally renown beaded jewelry artist. You can watch your future purchases be created right before your very eyes! The Rickie Report shares the details, including bus transportation from both Boynton Beach and Palm Beach Gardens. Don’t miss this exciting day! to visit some of Florida’s historical gems! The Mandel JCC is proud to offer a one-of-a- kind tour around the historically beautiful Hutchinson Island! Our day will begin at the Elliot Museum, which was built by Sterling Elliot’s proud son Harmon as a tribute to his father. The tour will give guests time to travel through the mind of this creative genius. Sterling was a famous inventor who held more than 125 patents in his lifetime! Some of his inventions include the first knot tying machine, the Elliot addressing machine, the pneumatic tire, the unequal turning of the front wheels or the steering knuckle- which was a critical element in the success of the automobile. In June of 2012, the museum merged with the Classic Boat and Maritime Museum. This will give patrons the opportunity to not only appreciate Elliot’s work, but to also see a wonderful collection of classical boats, boat models along with appreciating local maritime history. Following these two tours, we will have a wonderful lunch at the Prawnbroker. Then, we will end our day at The Fish House Art Center. Located in the historic fishing village of Port Salerno, this is one of the last commercial fish houses that are still in operation. Situated on the Manatee Pocket waterfront, patrons will have the opportunity to explore the work of the eight resident artists that reside at the Art Center. With glass arts, fine art painters, silk artists who create wearable art, a weaver and a nationally renown beaded jewelry artist, you can watch your future purchases be created right before your very eyes! For more information visit the JCC’s website at www.jcconline.com. Feel free to contact us at 561-712-5232. The address for this event is 5221 Hood Rd, Palm Beach Gardens, FL 33418.